I love shopping for treasure. It's one of my favorite things to do. And that's exactly what I did this morning when I needed a break and get out of the house for a little while. I went to my favorite store in town, it's called Trash and Treasure. It has a little mix of antique, vintage, and second hand items including furniture. Every time I go, there's something new. That is what I love the most, the element of surprise. Not knowing what I'm going to find. This is what followed me home. 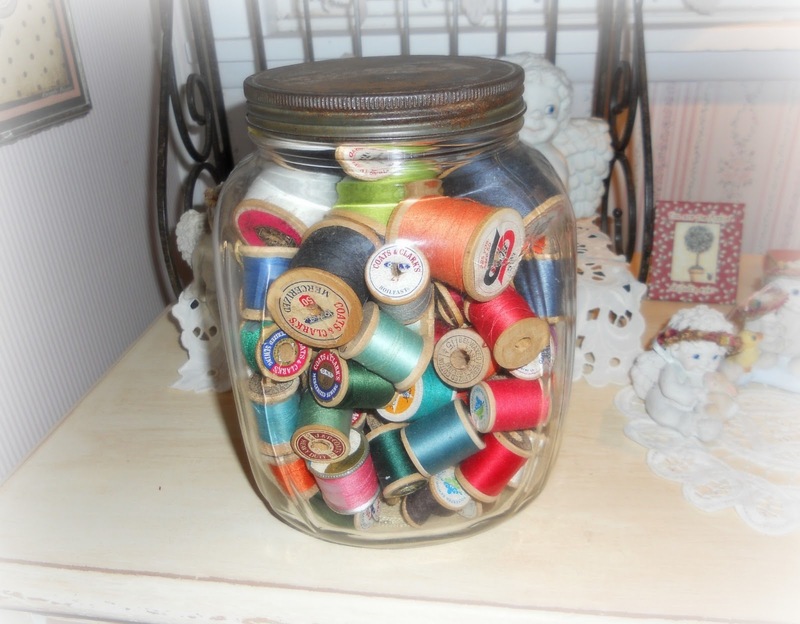 A big jar full of vintage sewing thread. It's packed full. All the spools are wooden. And don't you just love the colors? So vibrant and pretty! The jar itself is pretty cool too. The lid is a little rusty but I think it just adds to the charm. Here it is in my craft closet hanging out with the rest of my thread and button collection. Everything looks better in jars, don't you think? I also bought a bag full of yarn and some knitting needles and one crochet hook. I didn't pay a whole lot for it so I think I got a good deal considering how much yarn goes for these days. Having a hobby is not cheap. Got it all home and realized my sewing closet was a bit of a mess. So I got busy organizing and cleaning. Turned into a whole day thing but it looks so much better. I have a couple of projects going on right now. I'm making more of the soft dolls I made a few months ago. You can read about that post here. I'm also crocheting a baby romper. It might take me a while to show it to you because I've started it like four times. 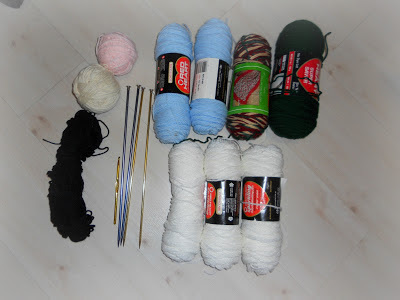 I can't figure out what crochet hook to use. Pattern called for a zero but don't know what that is. I'm guessing it's in foreign terms so I'm just guessing at the sizes. I think I'm on the right track now, hopefully! Hi Foxxy! I think the jar of old spools of thread are too cute! I agree, the colors are so pretty! You've had a very productive day, thrifting, organizing and doing projects! It always feels good! Blessings~~~have a wonderful week! Roxie Thank you for your sweet comments! 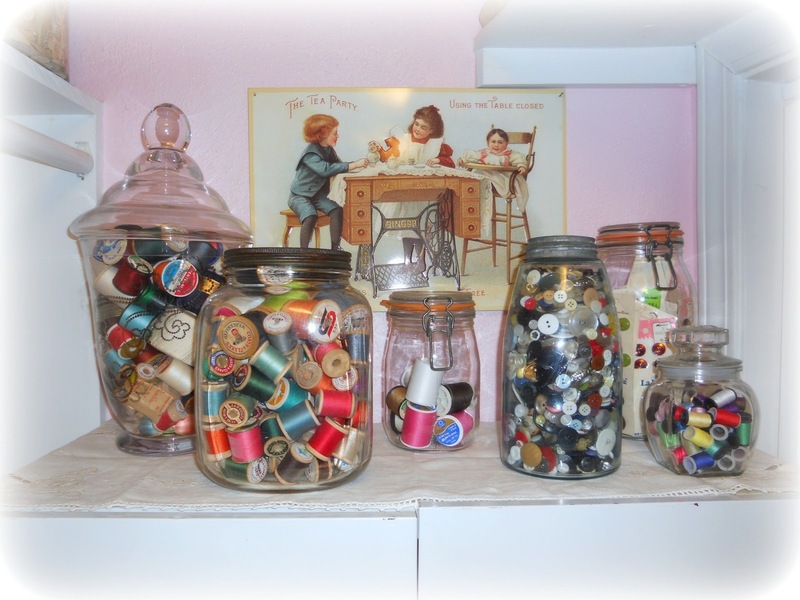 I love all your jars of thread! I would love to have so many colors. 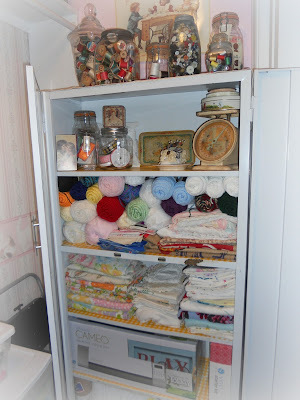 And your sewing closet is wonderful, that's something I reeeeally need. 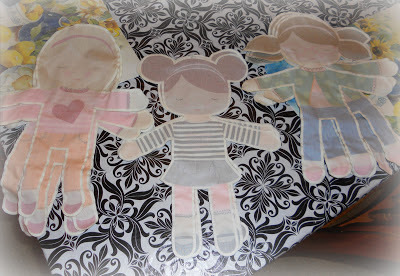 I'm looking at ways to accomodate all of my sewing and yarn stuff right now. Hi Foxxy, it looks so nice on the shelf your colorful thread and you can have some yarn fun too! Hi there Foxxy...yes your treasures are looking very pretty . I love all of your jars. Thanks for stopping buy to visit me :) it makes me happy! I loved seeing that jar of thread. LOVE the colors!! I have a glass lidded canister full of wooden spools of thread on a shelf in my craft space too.